from letting go of my work. Talk about madness. So, after countless reads, I finished final edits for my second novel on March 1st, and it’s going out to a few beta readers in Times New Roman 12-point font with bland chapter headings. Yes, I wonder what 14-point Trebuchet headings, aligned left, would add to the manuscript, but I’m not going there. In the meantime, March (Writing) Madness consumes me—all I want to do is pick up my incomplete NaNoWriMo novel and get cracking. I suppose this makes me a writer. I love the writing part—sitting alone in my studio, making up stories, and living with characters who spring from chance encounters or from slivers of my own imagination. Is it madness to thrive on the solitary pursuit of writing (and formatting)? Likely so. Regardless, I love every moment. 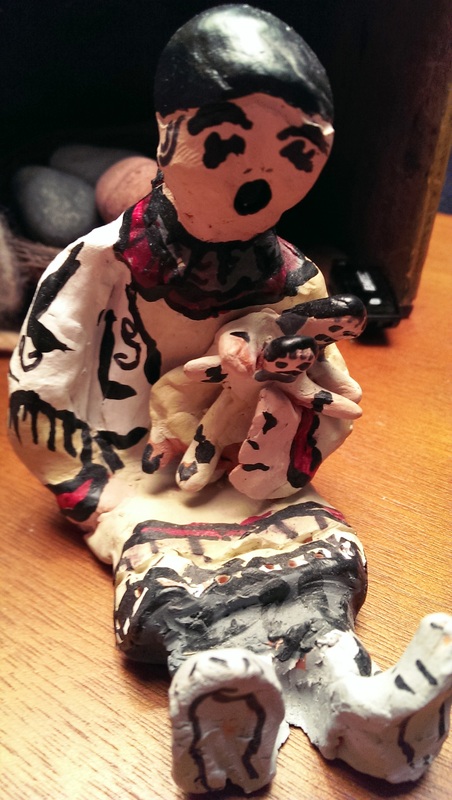 Ginny Merett made this Storyteller Doll that keeps me company.